The US military is continuing work on a portable, robotic drone/missile which could be used to kill individual human beings from afar. The weapon, codenamed "Anubis", has now moved into the final stages of development. sort of super sniper weapon by British forces in Afghanistan. The latest news comes in a federal budget announcement that California hi-tech firm Aerovironment, well-known as a specialist in very small UAVs, has received a $1.18m contract for "Anubis Phase III". Phase III is the penultimate or final stage in most US military tech projects, indicating that Anubis is close to maturity. According to other US government budget documents unearthed by the Ares blog, Anubis is a "Tactical MAV [Micro Air Vehicle] for Time-Sensitive Fleeting Targets" and add that it "is to address the need for a micro air vehicle that can engage high-value maneuvering targets". The deadly little machine is also described as a "non-line-of-sight munition with man-in-the loop target ID with very low collateral damage". Aerovironment has also been working on a project it calls "Switchblade" since at least 2007, which is to deliver a portable, tube-launched "loitering munition" of the sort now becoming trendy in some nations' artillery units. The Switchblade, having been shot out of its disposable launch tube, pops out its wings and flies about on silent electric propulsion for as long as 15 minutes, scanning the terrain below with an electro-optical system. As soon as its target is found, the silent Switchblade plunges out of the sky like a small robotic kamikaze, detonating its small warhead on impact to take out things as small as an individual human. Anubis, then, may be no more than Switchblade by another name - or it might be based on still smaller Aerovironment offerings such as the Wasp throw-plane or the palm-sized, hovering Nano Air Vehicle. Either way, such technology may soon be taking a lot of business away from snipers and car-bombers. Why spend ages infiltrating an enemy organisation and planting explosives, or painstakingly sneaking to within a couple of line-of-sight kilometres lugging your high-powered sniper rifle? The modern-day assassin needs simply to get within a few miles of his victim and pop off a Switchblade/Anubis programmed to head for the rough coordinates of the relevant hotel, road or whatever. Soon the silent, winged messenger of death is circling above the killing zone, while the assassin - or perhaps his shadowy masters in some distant country - view the remote imagery in comfort. Once the hapless target comes into view the stealthy droid assassin swoops down and snuffs him out in a small, relatively clinical blast - probably no more devastating than a grenade or a single autocannon shell. Another victim has been claimed by Anubis, guardian of the dead. There's no doubt that some of this sort of thing is coming: military forces are already using smaller guided missiles originally designed to destroy tanks against small enemy teams, vehicles or even individuals. 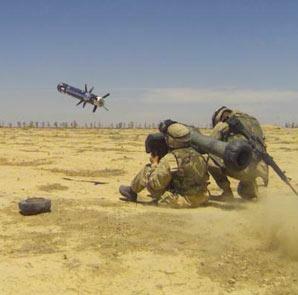 Examples include the air-launched Hellfire and the shoulder-fired Javelin, pictured above. British troops in Afghanistan have fired so many Javelins that the Army has recently been forced to buy a load more, despite the fact that the Taliban have no tanks.